Hello :) Hope you have enjoyed looking around the new site!! Please keep in mind this is only the early stages in development--so check back later for more content & updates!! This is my first post on the new BLOG & so many exciting things have been happening for our business that i just dont know where to begin!! Next up, Julia's House (formerly Joanna Gail Photography) has always been a referral/word of mouth based small business but this year we have invested in some advertising with our profits from 2012!! (we had our best year yet!) 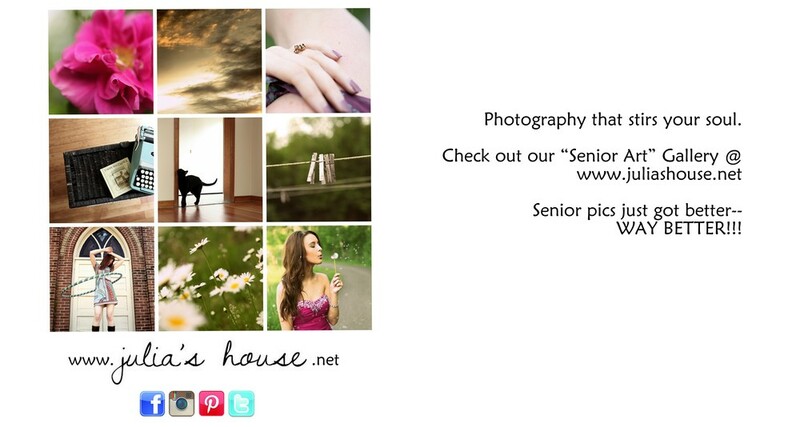 Posted below is my ad for the Stillwater Area High School yearbook!! ALSO-- we have become part of the WeddingWire Network!! You can check out our profile by clicking on the WeddingWire icon below. The WeddingWire Network is the easiest online way to find local wedding venues, cakes, dresses, invitations & more. It is the largest wedding network in the US and Canada, and it houses 5 of the top 6 wedding websites!! Now that we are on the WeddingWire network our "Julia's House" profile will come up in search engines for Martha Stewart Weddings, Brides, Wedding Bee, Project Bride & many more!!! Also we are now accepting credit card payments!!! !